Russia has done it again. This time it is in Syria. Last Friday Putin's missiles have killed the leader of the opposition fighting the regime of the mass murderer, Syrian President Bashar al-Assad. The Syrian Observatory for Human Rights (SOHR), a network with wide contacts inside Syria, said aircraft targeted a meeting of Jaysh al-Islam’s leadership in eastern Ghouta, killing Zahran Alloush, its head, and five other senior commanders. These latest casualties once again show that contrary to its claims, Russia is more interested in wiping out moderate opposition to Assad than going after Daesh (ISIL). Alloush founded Liwa al-Islam and Jaysh al-Islam, two significant rebel factions early in the Syrian Civil War. He was considered by area experts as a credible, charismatic and moderate leader. His rebel forces have maintained control over areas in the suburbs of Damascus despite years of siege by the Assad regime and relentless aerial campaigns on opposition-held areas. Eastern Ghouta was even subjected to chemical attacks when the government launched missiles laced with sarin in the area, killing over a thousand people – including many children. Alloush was ideologically at odds with Daesh (ISIL) and al Qaeda, espousing a more moderate brand of Islam. He fought against them and drove them out of his territory. "They [Russians] killed a man who was going to play a crucial role in Syria," said Ahmad Tumah, the designated opposition prime minister. "The death of Zahran could lead to more targeted killings of prominent opposition commanders and politicians." In all likelihood Alloush’s assassination will undermine the peace talks with the hated regime by further polarizing various camps involved in the unrest and strengthening the extremist elements. Putin’s actions remind me of the Russian strategy towards Chechnya. Remember Dzhokhar Dudayev, the Chechen leader who was the first President of the Chechen Republic of Ichkeria, a breakaway state in the North Caucasus? After a very successful career as an air force general in the Soviet Union, he resigned in 1990. In May 1990, Dudayev returned to Grozny, the Chechen capital, to devote himself to local politics. He was elected head of the Executive Committee of the unofficial opposition All-National Congress of the Chechen People (NCChP), which advocated sovereignty for Chechnya as a separate republic of the Soviet Union (the Chechen-Ingush ASSR had the status of an autonomous republic of the Russian Soviet Federative Socialist Republic). When the Soviet Union was imploding, NCChP took control of Chechnya. In an October 1991 referendum Dudayev was confirmed as the president of the breakaway republic. He unilaterally declared the republic's sovereignty and its independence from Soviet Union. In November 1991, the then Russian President Boris Yeltsin dispatched troops to Grozny, but they were withdrawn when Dudayev's forces prevented them from leaving the airport. Russia refused to recognize the republic's independence, but hesitated to use further force against the separatists. From this point the Chechen-Ingush Republic had become a de facto independent state. In 1993, Chechnya declared full independence. On December 1, 1994 the Russians began bombing Grozny, capital of the breakaway republic, savagely killing more than a hundred thousand civilians and displacing another half a million. As the calls for a peaceful settlement of the crisis became intense and louder Dudayev took a more conciliatory position and was willing to negotiate with the Duma. Beginning in June 1995, his Chief of Staff, General Aslan Maskhadov (a former colonel in the Soviet Army), had already begun taking part in peace talks in Grozny to resolve the crisis in Chechnya. However, Kremlin had a different plan for Dudayev and Chechnya. It wanted him eliminated so that the Chechens would be left without of any powerful voice from the breakaway republic. The fateful day came on 21 April 1996 when two laser-guided missiles killed Dudayev. At the time, he was using a satellite phone, reportedly talking to a liberal deputy of the Duma in Moscow, probably Konstantin Borovoy. His location was detected by a Russian reconnaissance aircraft, which intercepted his phone call. Additional aircrafts were dispatched (a Su-24MR and a Su-25) to locate Dudayev and fire a guided missile. Exact details of this operation were never released by the Russian government. Russian reconnaissance planes in the area had been monitoring satellite communications for quite some time trying to match Dudayev's voice signature to the existing samples of his speech. It was claimed Dudayev was killed by a combination of a rocket attack and a booby trap. He was 52 years old when he was martyred. Dudayev’s death was announced on the interrupted television broadcast by Shamil Basayev, the Chechen guerrilla commander, considered mastermind for some of the most violent hostage takings inside Russia. Dudayev was immediately succeeded by his Vice-President Zelimkhan Yandarbiyev (as acting President) and then, after the 1997 popular elections, by his wartime Chief of Staff, General Aslan Maskhadov. Yandarbiyev was a literary scholar, poet and children's literature writer. As a peace-loving moderate leader, he headed a Chechen delegation in late May 1996 that met Russian President Boris Yeltsin and Prime Minister Viktor Chernomyrdin for peace talks at the Kremlin that resulted in a ceasefire agreement on May 27, 1996. With the signing of the Khasav-Yurt Accord on 31 August 1996 between Russian General Alexander Lebed and Chechen General Aslan Maskhadov, a ceasefire agreement was reached, thus, marking the end of the First Chechen War. On 17 October 1996, General Maskhadov was appointed Prime Minister. He was elected president in free democratic presidential and parliamentary elections held in Chechnya under the aegis of the OSCE (Organization for Security and Co-operation in Europe) in January 1997. The elections were conducted on the basis of the Chechen constitution adopted in March 1992, according to which the Chechen Republic was an independent state. Representatives of more than 20 countries, as well as the United Nations and the OSCE, attended the elections as observers. On May 12, 1997, the presidents of Russia and Chechnya, Boris Yeltsin and Aslan Maskhadov, met at the Kremlin to sign final version of the treaty. Chechnya, however, was in the ruins with almost half of its people internally displaced. The economy was severely devastated and the warlords had no intention to disband their militias. Worse yet, the extremist Wahabi/Salafis took the war into the neighboring Republic of Dagestan in August of 1999, which was condemned by Maskhadov. In the meantime, Vladimir Putin, a retired KGB agent, had entered Russian politics. On 26 March 1997, President Boris Yeltsin appointed him deputy chief of Presidential Staff, which he remained until May 1998. On 25 July 1998, Yeltsin appointed him head of the Federal Security Service (Russian abbreviation: FSB; one of the successor agencies to the KGB), a position Putin occupied until August 1999 from where he was able to dictate covert wars against the Chechens to undermine the treaty that his boss and Maskhadov had signed in 1997. On 16 August 1999, the State Duma approved his appointment as Prime Minister. On 31 December of that year when Yeltsin unexpectedly resigned Putin became Acting President of the Russian Federation. He was inaugurated president on 7 May 2000. On October 1, 1999 Putin declared the authority of President Maskhadov and his parliament illegitimate and Russian forces invaded Chechnya in what is called the Second Chechen War, which was to last until mid-April of 2009. Although the invasion of Dagestan by Chechen fighters in August-September 1999, and the suspected apartment bombings in Moscow in October of that year (believed later to be a false flag attack coordinated by the FSB in order to win public support for a new full-scale war in Chechnya, which boosted Prime Minister and former FSB Director Putin's popularity) were used as justifications for this war, the decision to invade Chechnya was made in March of 1999. The campaign ended the de facto independence of Chechnya and restored Russian federal control over the territory. Russia established direct rule of Chechnya in May 2000. However, Chechen militant resistance continued throughout the North Caucasus region inflicting heavy Russian casualties and challenging Russian political control over Chechnya for several more years. Some Chechen separatists also carried out attacks against civilians inside Russia. The exact death toll from the Second Chechen War is unknown. Unofficial estimates range from 25,000 to 50,000 dead or missing, mostly civilians in Chechnya. Out of some 800,000 residents of Chechnya nearly 350,000 took refuge in nearby republics. Russian casualties are estimated to be between 5,200 (official Russian casualty figures) and 11,000 (according to the Committee of Soldiers' Mothers). 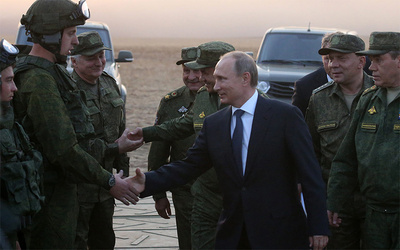 Putin’s long arms stretched far beyond Russia. Yandarbiyev was killed by Russian agents when a bomb ripped through his SUV in the Qatari capital, Doha, where he had been living since 1999 promoting the Chechen cause. Yandarbiyev was seriously wounded and died in hospital. His 13-year-old son Daud was seriously injured. The day after the attack, Qatari authorities arrested three Russians in a Russian embassy villa. One of them, the first secretary of the Russian Embassy in Qatar, Aleksandr Fetisov, was released in March due to his diplomatic immunity. (There were some speculations that Fetisov had been released in exchange for Qatari wrestlers detained in Moscow.) The remaining two, the GRU (secret intelligence) agents Anatoly Yablochkov (also known as Belashkov) and Vasily Pugachyov (sometimes misspelled as Bogachyov), were charged with the assassination of Yandarbiyev, an assassination attempt of his son Daud Yandarbiyev, and smuggling weapons into Qatar. On June 30, 2004, both Russian agents were sentenced to life imprisonment; passing the sentence, the judge stated that they had acted on orders from the Russian leadership. The verdict caused severe tensions between Qatar and Russia, and on December 23, 2004, Qatar agreed to extradite the prisoners to Russia, where they would serve out their life sentences. The agents however received a heroes' welcome on returning to Moscow in January 2005 but disappeared from public view shortly afterwards. The Russian prison authorities admitted in February 2005 that they were not in jail, but said that a sentence handed down in Qatar was "irrelevant" in Russia. Aslan Maskhadov, considered as being instrumental to the Chechen victory over the Russian forces in the first Chechen War (1994-96), too, was killed by the Russians. He was killed in Tolstoy-Yurt, a village in northern Chechnya, on March 8, 2005, less than a month after he had announced the cease-fire with the Russian forces. Now Alloush is dead. The Russian strategy for Syria seems obvious that it wants to repeat the Chechen experiment of weakening rebel groups by killing their moderate leaders, thereby strengthening Assad’s bargaining power in an effort to present itself as the only palatable alternative on the Syrian battlefield. “Alloush’s martyrdom should be a turning point in the history of the revolution and rebel groups should realize they are facing a war of extermination and uprooting by Putin’s regime,” said Labib al Nahhas, a senior figure in the main Ahrar al-Sham group. Similarly, Tumah is concerned that Russia and Syria "are willing to go after every single powerful person in the opposition to undermine the whole [peace] process". In a separate statement, the National Coalition for Syrian Revolutionary and Opposition Forces, an umbrella organization headed by Tumah, condemned Zahran's killing, describing it as "a clear victory for terrorism and ISIL". "It weakens the free army factions that confronted terrorism and undermined its foundations," the statement said on Saturday. "The attack is also an attempt to abort the UN efforts of a political settlement." Speaking to Al Jazeera, Rami Khouri of the American University in Beirut said, "The Russians and the Syrians, together or one of them, killed Alloush, presumably because they don't want this kind of powerful, credible, leader who is willing to engage diplomatically." "They don't want that kind of strong centrist Syrian-based opposition group to gain ground. By killing the leader, they think they can knock out the whole group." As history has shown, such tactics can misfire and bring more harm than good broadening the battlefield and victimizing innocent civilians who live far away from the killing fields. Apparently, Putin’s Russia has not learned that bitter lesson well and wants to repeat the mess. Jaysh al-Islam has named Abu Hammam al-Buwidani as Alloush’s successor. Late on Friday, Buwidani called on the armed opposition to close ranks and unify against Assad. He also condemned what he called the "forces of evil" conspiring against the rights of Syrian civilians. The U.N. Security Council on December 18 unanimously approved a resolution endorsing an international road map for a Syrian peace process, a rare show of consensus among major powers. The United Nations said it aimed to convene peace talks in Geneva on January 25 to try to end nearly five years of civil war and it appealed to the warring parties not to allow events on the ground to derail the process. The Syrian opposition vowed to participate in the upcoming talks.